Hey friends. I have a busy day ahead with Ella having a dentist appt, gymnastics, and a PTA meeting. I had to take a little time for some Girl Chat. 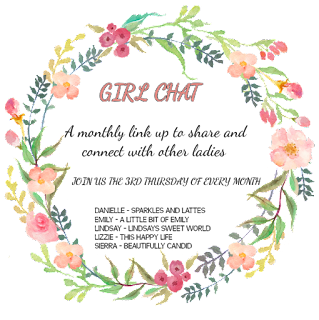 Another month of Girl Chat: with Emily, Danielle, Lindsay, Lizzie, and Sierra. I can't believe that Easter is already right around the corner. Growing up Easter wasn't a huge deal. We got Easter Baskets from the Easter Bunny. They normally were hid someone in the house and we played Hot Cold to find it. There was an Easter Egg hunt and we had ham for dinner. Since having kids I try to make it more of a family day. Seeing both of our families. have a Easter Egg Hunt, get an Easter Basket, enjoy a special breakfast (bunny pancakes), and weather permitting go for a walk or hike. I still want the day to feel relaxed and not rushed going from one house to the next. I am not big on giving my kids a basket full of candy for Easter, which is what I got as a kid. 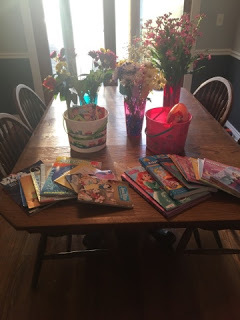 Last year both kids got a small basket with some candy and a bunch of books and coloring books. One year Ella got a soccer ball and net. Items that will be used in the coming months and not just thrown away when the kids aren't looking. Their will be a little bit of candy, I am not that mean of a mom. Does your family has a Easter Basket tradition? Do you do candy or toys? I LOVE the idea of getting them little umbrellas - that is so cute! Goes perfectly with the season! Thanks for linking up! So you and Emily do the hiding of the baskets, I am totally doing that this for my kids! I think they will love it! I actually got my kids all their own little umbrellas this year, they are going to be so excited!! Umbrellas can be so fun to play with outside too even if it isn't raining. I love the idea of hiding clues in the eggs. I need to look for the Minnie umbrellas in my dollar spot. They were not at Target this weekend. Thanks for linking up!